Vice President Yemi Osinbajo has not endorsed Lagos APC gubernatorial aspirant Jide Sanwo-Olu who is contesting the ticket against incumbent Governor Akinwumi Ambode, it has been learnt. APC gubernatorial aspirants Babajide Sanwo-Olu and Kunle Hamzat were at the premises of the GAC meeting ahead of the Vice President’s arrival. It was while he was coming out of the meeting that Mr. Sanwo-Olu and Mr. Hamzat took advantage of the VP’S presence to take the photos which are now being falsely paraded as proof of endorsement. Ambode world press conference onging. Ambode is throwing some fireworks and shaking tables. "Sanwo-olu was arrested for spending fake dollars in a club in USA--. 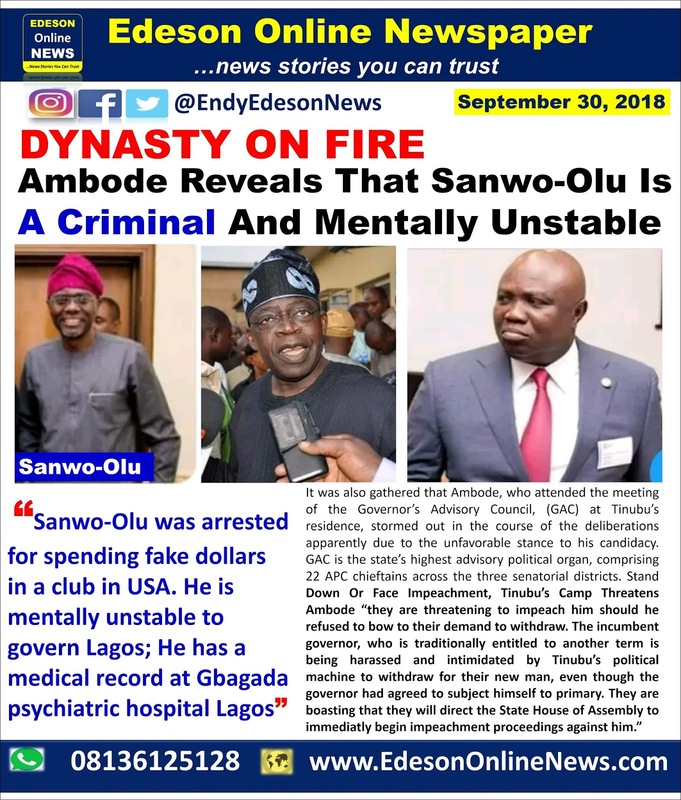 Samwo-olu is mentally unstable, he has a medical record at Gbagada psychiatric hospital" --Ambode reveals. They have pushed Ambode too far. It was also gathered that Ambode, who attended the meeting of the Governor’s Advisory Council, (GAC) at Tinubu’s residence, stormed out in the course of the deliberations apparently due to the unfavorable stance to his candidacy. GAC is the state’s highest advisory political organ, comprising 22 APC chieftains across the three senatorial districts. “they are threatening to impeach him should he refused to bow to their demand to withdraw. The incumbent governor, who is traditionally entitled to another term is being harassed and intimidated by Tinubu’s political machine to withdraw for their new man, even though the governor had agreed to subject himself to primary. They are boasting that they will direct the State House of Assembly to immediatly begin impeachment proceedings against him. How useful is the Governor's Advisory Council (GAC) to the governor? It is an advisory council but the council appears to be pushing the governor around and dishing out orders to the governor!!! It should not be so. By the way, who put the council in place in the first place? Is the council an organ of the Lagos state government??? Why is the office of the council in Tinubu's parlour? The council's office should be somewhere at the Lagos state secretariat, Alausa, Ikeja, for me. I believe something is wrong somewhere. If I were the governor, I would have stopped attending the meetings of the council or better still, I would have disbanded the council since it appears not to be a useful body to the governor. I see the council as one of Tinubu's tools of control. Tinubu should allow his political boys to live their own political life. Yes, Tinubu helped Ambode to become the governor of Lagos state. Tinubu should allow the governor to do his job and should not infringe on his right. The governor has the right to contest again if he so wishes. It is the residents of Lagos state that should reject him at the polls or give him the mandate to run the affairs of the state for another term. Tinubu should remember that some people also helped him to become the governor of Lagos state in 1999 and none of them ordered him or pushed him around or interfered with his administration of the state as he is trying to do to Ambode. Tinubu should allow Ambode be and enjoy his rights as the governor of Lagos state. This man called Tinubu is so darn wicked. I just hate him with a passion!.. How can you tell an incumbent to withdraw frm contesting for a second tenure which he is entitled to & threaten to impeach him if he refuses?, that's unlawfully illegal now. Sometimes I wonder who Tinubu thinks he is... It seems clearly to me that he has the list of potential aspirants to seemingly occupy government house Alausa, Ikeja. His interference is just out of control. Meanwhile, whoever he endorses, ends up doing nothing in Lagos. Take a look at Alabarajo...so nasty s place.